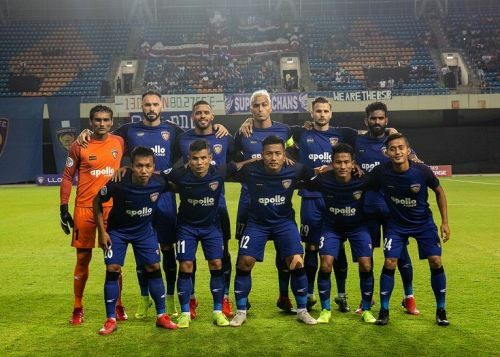 Indian Super League (ISL) side Chennaiyin FC secured their spot in the group stage of the 2019 AFC Cup after a 1-0 win aggregate win over Sri Lankan side Colombo FC on Wednesday in Ahmedabad. Playing their home leg at The Arena by TranStadia in Ahmedabad instead of their normal home ground at the Jawaharlal Nehru Stadium in Chennai, the 2017-18 ISL champions edged out their Sri Lankan opponents by the odd goal to move through. Jeje Lalpekhlua was the man who scored the only goal of the game after capitalizing on a defensive error from Colombo. After the first leg in Colombo finished goalless there was always the threat of an away goal proving decisive in the second leg, but Chennaiyin were defensively solid and managed to keep a clean sheet to ensure they were spared an ignominious exit at the playoff stage of the AFC Cup. Chennaiyin made three changes to the team that took to the field in the first leg a week earlier. Australian Chris Herd came in for Germanpreet Singh. CK Vineeth was also brought in to play up top with Jeje. Thoi Singh was the other change, playing on the right wing with Anirudh Thapa having to contend with a spot on the bench. Here we look at the five things of interest from the game. The first leg in Colombo was played at 3:30 PM and in very high temperatures with a lot of humidity. Chennaiyin FC coach Gregory himself had said pre-match about how his players struggled to play in the Colombo heat and humidity with the time of day another deterrent. Wednesday's match setting was more to their liking; a 7:30 PM kickoff and in a more favourable climate, Chennaiyin FC were able to ensure their players gave it their full intensity and the pitch too was excellent, assisting the teams in their passing. Barring some late withdrawals owing to cramp, the Chennaiyin players largely were physically up to the mark in this match.